The Grand Avenue Business Association (GABA) recently published a directory of merchants in the Grand Avenue district. They are available at most Grand Avenue stores. Now you can download the directory, too. 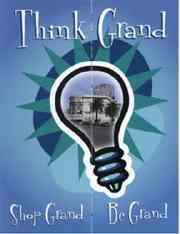 The Grand Avenue Business Association (GABA) recently published a directory of merchants in the Grand Avenue district. They are available at most Grand Avenue stores. The Safeway at 3747 Grand Avenue re-opened November 4th, remodeled into a “lifestyle store,” with an expanded floral department, redesigned produce section with a larger selection of organic foods, and a bigger wine and liquor department. Relocated Cuban-Latin restaurant aims to revolutionize how Bay Area people think about Latin food. Stu Sweetow owns Audio Visual Consultants at 3738 Grand Avenue. Stu is the acting chair of the Communications Committee of the Grand Avenue Merchants Association (GABA), which works to make the Grand Avenue shopping district a safe and fun destination for shoppers. GABA is composed of businesses and merchants on Grand Avenue between MacArthur and Wildwood and on Santa Clara Avenue, adjacent to Grand. For more information about GABA, contact its president, Nicholas Eveleigh, at the Grand Lake Smoke Shop at (510)268-4070.